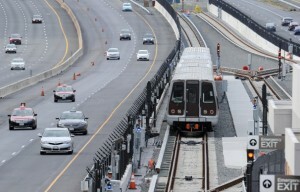 When the Metropolitan Washington Airports Authority and Metro came to an agreement on Silver Line turnover on Thursday, it was hailed from Capitol Hill to Dulles Airport as a major step towards getting the rail extension open this summer. The project is already seven months behind schedule and will be missing a project manager since Pat Nowakowski announced last week he is leaving the job. It is also $150 million over budget. And those are just the issues before one starts to look at the list featured in the agreement, which includes more than 50 items, some of them major system woes that need to be addressed before passengers can safely ride the line. The Silver Line’s Phase 1 will run from East Falls Church to Reston’s Wiehle Avenue. Dulles Transit Partners, the contractor building the line, submitted for “substantial completion” on April 9, the same day $25,000-a-day penalties were slated to begin under the terms of the contract with MWAA. The submission was actually a resubmission as DTP, a division of Bechtel, also filed on Feb. 7 — and MWAA found issues of 7 of 12 areas in its review. Those issues were supposed to be fixed before MWAA could accept the project to turn over to Metro. MWAA said Thursday it was accepting the project as substantially complete, even if dozens of punchlist items were, in fact, not complete. Metro said if the agency waited until MWAA completed all the necessary work before taking custody of the project, passenger service probably wouldn’t begin until late 2014 — about a year behind schedule. But there is still no opening day in site and fixes ranging from “ponding in stations” to automatic train control glitches to “waterproofing at Wiehle Station are not exactly quick cosmetic fixes. Reimburse WMATA (Metro) for costs it has incurred in providing technical advisory services as a direct result of the line not being completed on Sept. 9, 2013. Cover Metro’s cost of having two employees, 24 hours a day, seven days a week, monitoring the Horton Remote Terminal Units (RTUs), which help run the crucial Automatic Train Control software. As mentioned in a $1.8 million contract MWAA awarded last week to a New York company, the current controls are below par and replacing and upgrading could take a year. MWAA will also pay Metro the costs of managing said contract with Alstom Signaling. Maynard says if the costs are shared under the funding partners agreement among MWAA, Loudoun, and Fairfax counties, it means that Dulles Toll Road users will end up paying about two-thirds of the added cost. MWAA officials said last week about $23 million is available in its contingency fund. Metro General Manager Richard Sarles said Thursday that Metro will likely take control of the line next month and that allowing MWAA to complete the items after that will help get the line open this summer. Sen. Mark Warner (D), who met with MWAA officials this week, says both agencies need to get the project done correctly and quickly. “I strongly encourage MWAA and WMATA to maintain a sense of urgency so that we will see the Silver Line up and running before the end of summer,” he said in a statement. Warner has been critical of the Silver Line’s delays for months.